Step 1 Heat the oven to 350 degrees. Butter a 12-by-9-inch casserole dish. Step 2 In a bowl, toss the artichokes, tomatoes, chives, basil and parsley, and cheddar and parmesan cheeses together gently. Spread evenly in the dish. Step 3Whisk together the eggs, cream, salt and pepper. Pour over vegetable mixture. Step 4Put the frittata in a larger pan, and add enough hot water to reach halfway up the side of the frittata dish. Step 5Bake until the top is lightly golden, then cover with foil and continue baking until the frittata is set (a knife inserted should come out clean), 40 to 50 minutes. Cool slightly before slicing. Serve warm or at room temperature. In Recipes-list.com we have selected the most viewed recipes from category - Breakfasts Healthy eating Main courses Vegetarian . Enjoy the best recipes specially selected for you! 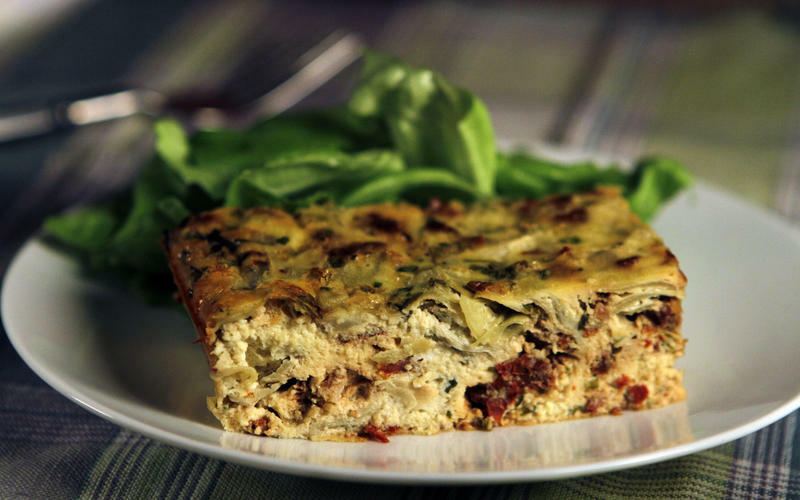 Artichoke and sun-dried tomato frittata is the right choice that will satisfy all your claims.